The Waddlepus (アワダコ?, lit. 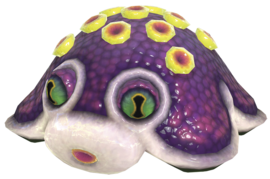 : "Bubble Octopus") is an enemy encountered in Pikmin 3. Waddlepuses are small, purple octopus-like creatures with several yellow pores covering their back. They have green eyes and small O-shaped mouth that hides a large yellow pore. The Waddlepus is also an aquatic enemy and can be encountered underwater as well as on land. Waddlepuses are generally calm enemies. They are always found sleeping and wake up only when Pikmin or a leader is nearby. Once disturbed, the Waddlepus will inflate itself and slowly waddle towards the leader and their Pikmin. If Pikmin are latched onto the Waddlepus when it inflates, they will be thrown off. Once inflated, the Waddlepus can then shoot out a stream of bubbles from either its mouth or from the pores on its back. These bubbles do not harm Pikmin, or leaders but rather trap them inside. The bubbles will eventually pop, but the player can prematurely pop them by throwing a Pikmin at them. The Waddlepus is a generally passive creature; unless a leader or Pikmin gets close to it, it will sleep in one position. When it is awake, the Waddlepus has two attacks at its disposal, both of which are harmless and involve bubbles; it will either blow bubbles out of its mouth to ensnare Pikmin directly in front of it, or release bubbles from the many pores on its body to get attacking Pikmin off of it. The Waddlepus is of moderate size and moves very slowly, making it an easy target in battle. A large group of Pikmin can easily take care of this creature. Note that, if the Waddlepus is not killed quickly enough, it will blow bubbles either from its mouth or the various yellow holes on its body. If a large group of Pikmin is not an option, use a few Pikmin to wake it up, and throw the rest on it when it begins to blow bubbles. Rock Pikmin work especially well in small groups: keep throwing them on the creature, and they should deal a good amount of damage. With 10 Rock Pikmin, it should take no more than two cycles to kill it. Just make sure to call all the Pikmin back before it starts blowing bubbles, and remember to pop them should a Pikmin or leader get trapped in them. "Waddlepus" is a portmanteau of "waddle", which means "moving while swaying left and right" and "octopus". In its Japanese name, アワダコ?, アワ? means "bubble", and ダコ? means "Octopus". Its internal name, awadako, matches the Japanese name. A Waddlepus blowing out of the yellow holes on its body. A close up of a Waddlepus through the KopPad. An interesting thing to note is that the bubbles will not pop if swarmed with Winged Pikmin; instead, it will keep rising further and further up. Regardless of how high up the bubble goes, the Pikmin will not die. It should be noted that the Waddlepus in Beastly Caverns is weaker than the ones found in other areas. This page was last edited on March 21, 2019, at 22:32.